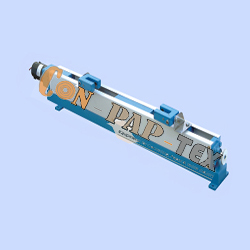 Normally, Pneumo-Hydraulic Web Guiding System is used for any winding. unwinding application for guiding the web to reduce the wastages of the material & to get high production output with minimum man power. Now, seeing the emerging demand of the market & few limitations of Pneumo-Hydro Web Guiding System, we have introduced Micro-processor based fully Electronic Line/Edge Guiding System with Photo-Cell Feed Back.